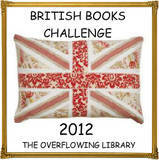 Welcome to the sixth month of the British Books Challenge. Please link your reviews below. I've just linked my first review for this challenge, and have just realised that I've entered my name instead of the book title name (my bad, sorry :s ) So where you read Pruedence is actually the book review of Finding Sky by Joss Stirling. Left my first review for June!! Haha Pruedence; I did the same thing first time too :). I've linked Secrets of the Henna Girl, Changeling and Little M's Dolphin Song. Wow, I've been reading quite a lot this month! Linked up my 3rd and the last review for june! !